Create a new document, 8" x 8". Select the Star Tool, under the Rectangle Tool. Create a new star, Radius 1 1", Radius 2 4", Points 4. 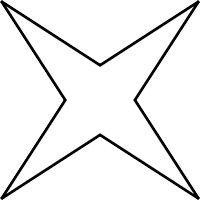 Set the center of the star at x 4", y 4" using the Transform window. 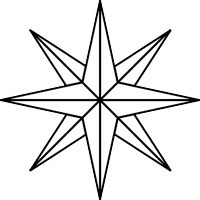 This is the basic shape used to create the Compass Rose. 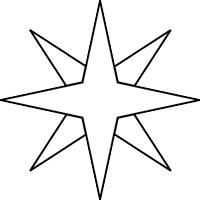 Select the star using the Selection Tool; copy and paste it. Using the transform window, rotate it 45 degrees and set the center at x 4", y 4". 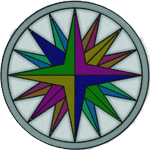 Now the Compass Rose has both primary and secondary cardinal points. Select the Line tool and make an 8" long line. Using the Transform window, set the center of the line at x 4", y 4" and the angle at 0 degrees. Make 3 more 8" long lines, at 45 degrees, 90 degrees, and 135 degrees, each centered at 4" x, 4" y. 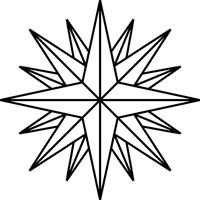 These are the center lines for the cardinal points. This shape can now be used to make the tertiary (WNW, etc.) cardinal points in one step. Under the Select Menu, choose All. Copy the object and paste in back. Using the Transform menu, rotate it 22.5 degrees and set the center at x 4", y 4". Scale to 87.5 %. 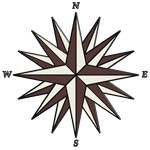 To make the traditional 3D effect for the compass rose, apply a dark color to every other section of the rose, and a light color to the others.